Turmeric is an awesome spice. It's a vibrant color, gives curry is distinctive flavor, and it has many health benefits. A lot of the health benefits of turmeric touted on the internet still need to be researched more, though. One thing is for sure: turmeric can help to reduce inflammation and is most effective and better absorbed when consumed with healthy fats and black pepper. Turmeric, also known as Curcuma longa, has been an important component of cooking in India and across Asia for centuries. Turmeric is a member of the same family of plants as ginger and cardamom: Zingiberaceae. A lot of species from this family of plants are known for their ability to reduce inflammation and ease nausea. Several compounds found in turmeric can help you to maintain your health, especially curcumin. You can have too much turmeric though, so don't over do it, and if you're on medication always ask your doctor before trying something new! 1. Reduces Inflammation: Turmeric can help ease inflammation that can cause a plethora of other problems. Inflammation is the cause of arthritis, IBS and migraines. A few studies have shown that turmeric is an effective aide in easing inflammation and pain. 2. Lowers Blood Sugar & Cholesterol: Incorporating turmeric into a healthy diet can help people with type 2 diabetes maintain healthy blood sugar levels. Incorporating turmeric into a plant based diet helps to lower cholesterol and internal inflammation significantly. 3. Helps with Menstruation: The curcumin found in turmeric can help to ease inflammation, which helps to ease menstrual symptoms like bloating and cramps. I always drink turmeric ginger tea mixed with a magnesium supplement when my period comes around, and it really does help me (and I suffer from terrible cramps ever since quitting birth control after 10 years of taking it)! 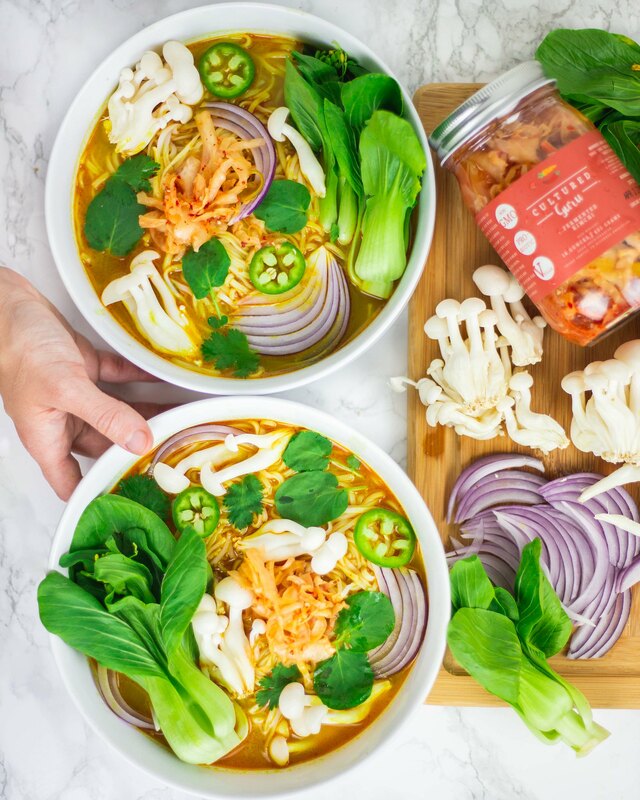 Thai Curry Soup Recipe: Our Favorite Way to Cook with Turmeric! Let me start off by saying... I've messed up a lot of soup in my life. Most people will tell you that soup is so easy to make, you just throw ingredients in a pot with water and seasoning, then it more than likely comes out great. Well... when I first ventured into cooking, my soups 99% of the time came out tasting like burnt, poorly seasoned water... It was when I used to eat meat, and I cooked everything way too long because I was afraid of parasites and familiar with the microbiology of undercooked meat.... so I burnt a lot of stuff. Obviously that explains the burnt flavor. Let's just say I am leaps and bounds better at cooking soup now. Now that I'm way more comfortable in the kitchen with just vegetables. Since I only cook with plants now, I love experimenting with soups, and this is the best tasting one I've made. Adding the Cultured Guru Kimchi in as a topping really completes the flavor too. Plus it doubles the health benefits of this soup, by adding billions of probiotics to a soup that's already anti-inflammatory. Enjoy the recipe! We use Thai Kitchen Brand Red Curry Paste, and the rest of the ingredients came from Trader Joe's and the Asian Market...OH and did y'all know you can cook soup in a wok?! Because I didn't, but as we were buying one from the Asian Market (aka the best place to buy a wok) the lovely lady at working there told us how to care for our wok and what we can use it for! I think she has started to recognize us as regulars in her store because we go there ALL the time. Anyways, rice noodles, miso, sesame oil, bok choy, mushrooms, tamari and coconut milk are all WAY cheaper at our local Asian market than other stores. We even buy organic there. So if you're thinking about cooking any sort of Asian inspired food (Japanese, Chinese, Thai, Vietnamese, Korean etc.) consider supporting your local Asian market for the ingredients. In a pot or wok over medium heat, sauté the sesame oil, olive oil, garlic and ginger for about 1 minute or until the garlic is lightly browned. Add in 1 cup of vegetable broth and bring to a simmer. Add in the 1/4 cup miso paste and combine until smooth. Add in the turmeric powder, maple syurp, Thai Red Curry Paste and Tamari and combine until smooth. Add the remaining vegetable broth, stir, and bring to a boil. Once the broth is boiling, add in 1 can of organic coconut milk and the tamari and bring to a boil. Remove from heat, and ladle into bowls with cooked rice noodles. Add all of the garnishes and toppings and enjoy! Don't forget to add the Cultured Guru Fermented Kimchi for a perfect probiotic boost!